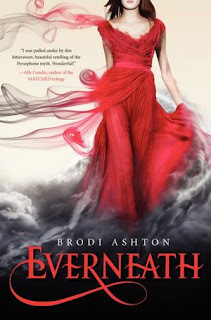 Book Summery: Last spring, Nikki Beckett vanished, sucked into an underworld known as the Everneath, where immortals Feed on the emotions of despairing humans. Now she's returned- to her old life, her family, her friends- before being banished back to the underworld... this time forever. She has six months before the Everneath comes to claim her. Nikki longs to spend these months reconnecting with her boyfriend, Jack, the one person she loves more than anything. But there's a problem: Cole, the smoldering immortal who first enticed her to the Everneath, has followed Nikki to the mortal world. And he'll do whatever it takes to bring her back- this time as his queen. This months book club was a very special and unique experience, the author Brodi Ashton joined in on our discussion. It was so fun to have Brodi there, she is such an enthusiastic and happy person who has a passion for writing. It was very interesting to learn about the writing process of the book as well as to hear her insights on our thoughts, ideas and discussion questions, she also seemed intrigued by some of our interpretations of some of the themes and events in the book. Kelly began our discussion with a quiz about the two myths that the book focuses on, the story of Persephone and the underworld and the story of Orpheus and Eurydice. This lead into a discussion about the use of mythology in the book. Brodi said that she has always had a passion for Greek mythology and watched a film version of The Taming of the Shrew millions of times while growing up. She also read tales from the classic d'Aulaires Book of Greek myths for bed time stories and that is where the idea of incorporating myths into a novel came from. We discussed the various connections of the characters, Jack symbolizing Orpheus and Cole being a type of symbol of Hades asking Nikki (who takes on a role similar to both Persephone and Eurydice) to come and be his queen so they could together rule the Everneath. While she wanted mythology to play a fairly dominate role in the story, Brodi did mention that she wanted certain connections to the different myths but didn't want her story to be an exact translation or rendition of any certain legend. We also briefly discussed the "cult" of the Daughters of Persephone and how their mothers raised their daughters to be sacrifices to the Everneath. Many of us wondered how those mothers could ever think of doing such an act, then Bethany brought up the connection of how this resembles certain cultures that are centered around bringing honor to the family such as the traditions of the Samurais, I found that to be an interesting insight. Angie then brought up the possibility that maybe Nikki's mother had been one of the Daughters of Persephone since we don't know too much about her and Nikki's case seems to be so unique .... We will just have to wait and see if this topic is revisited or further explained in the other books! The bulk of our discussion centered around the conflict of Jack vs. Cole. Most of our group was team Jack (I mean who wouldn't be, he sounded like an awesome catch) with a small glittering speck of hope for Cole. We debated if Cole's intentions were fueled by feelings of love for Nikki, or if all of his actions were driven by his desire to rule the Everneath. We also discussed if Cole could even feel or express different emotions since he was an everliving and his heart was separated from his body. We decided that his actions suggest that he is sensitive to the feelings of others and cares about them, in a few different cases throughout the book he shows compassion or concern for others thus leading us to believe that he has emotions. Cole also talked about his "heart cracking" and he seemed so saddened by the fact that Nikki and Jack attempted to destroy his "heart," thus showing more evidence of his ability to possibly be in love with Nikki. Brodi's insights on this topic were, since Cole is in such uncharted waters with Nikki, he has never had anyone survive the way she did, even he isn't sure if what he is feeling is love or just a desire to rule the Everneath. Brodi did state that Cole is clearly the villan of the story, he is a lovable villan, but a villan nonetheless. We did try and get as many hints about book two as we possibly could. Brodi said that she already has the entire book written and that it will be hitting the bookstores next January. She didn't give us too many spoilers but she did mention that we would be getting some back stories on some characters that might help us understand them a little better and that some characters that played fairly minor roles in Everneath, will be stepping up to the plate in book number two. We are all dying to find out what happens in the next two books and can't believe we have to wait all the way until next January to find out what happens!! Kitch you did a fabulous review. You should do my reviews from now on I think.